My professional background is in live television production. If you know anything about live television once it happens its happened….there is no turning back. I like doing things right the first time, then being able to sit back and enjoy. So when it comes to beer post ferment I rarely doing anything else to the beer I didn’t plan from the get go. Sometimes I have thought about maybe adding a little of this or that to maybe make the beer better, but I never do. Last month I wrote about the 3rd runnings bonus beer experiment I did. The beer is still tasting great, but since it was an experiment from the start I thought I might mess around with the finished beer a bit. I decided to see what the beer would taste like if the ph was lower. 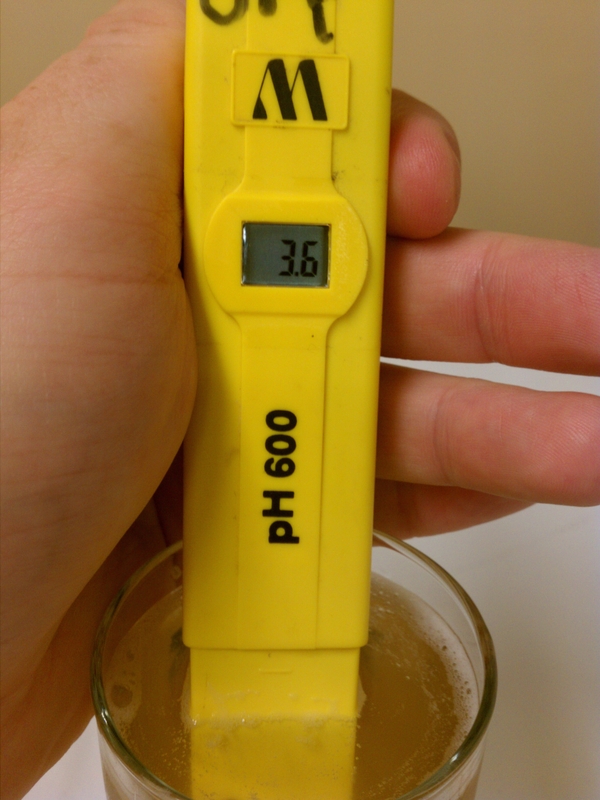 The ph level of the beer before anything was added came to 3.6. It had a nice lower level lactic sourness and a bit of Brett leaking through. For the sake of providing all the info I can the temp of the sample was 69.7F. Since this project would take place with carbed/cold conditioned beer I decided to use Food Grade 88% Lactic Acid to lower the ph. (This very potent acid is the same type you can use to bring down the ph of your mash if it’s too high.) 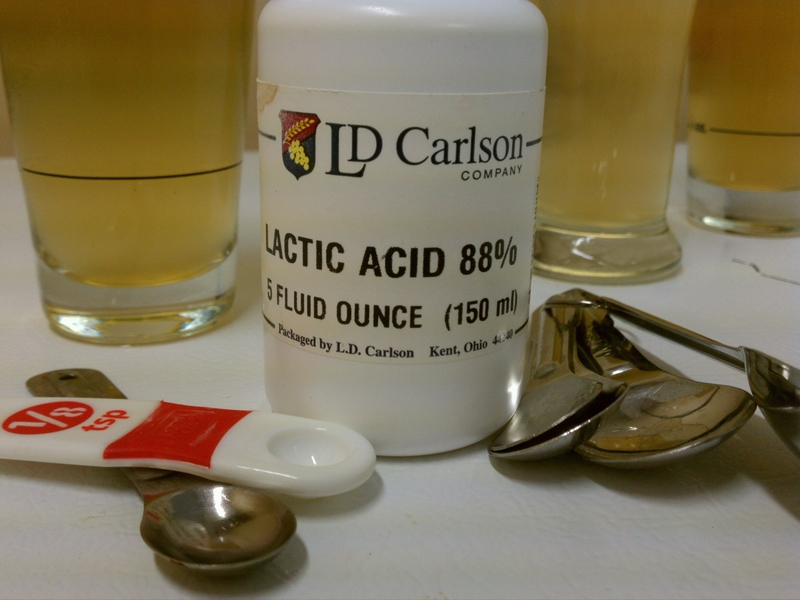 I know of a few brewers that have said using Lactic Acid to “sour” a beer will give off a medicinal or harsh flavor. Accomplished brewer Jamil Zanisheff has likened using Lactic Acid to “sour” a beer to microwaving a steak. I would agree with both of those observations if the Food Grade Lactic Acid was the only form of ph lowering being used. I didn’t have a dropper to use for measuring ml so I used a 1/8 tsp and did the test drop by drop. If this was a beer I was prepping for a competition I would seek out a dropper to really dial the levels in. The sample I ended up liking the most was with 3 drops of Lactic Acid. Those drops gave me a ph of 3.3. The resulting beer is definitely on the next level for me. The beer seemed to perk up and become more lively. A ph of 3.3 is on par with many commercial sour beer examples. According to Raj B Apte the ph of New Belgium LaFolie is 3.1, Cantillon Iris is 3.4, and 2002 Drie Fonteinen Gueze is 3.3. Generally speaking most ales are approximately 4.0ph. 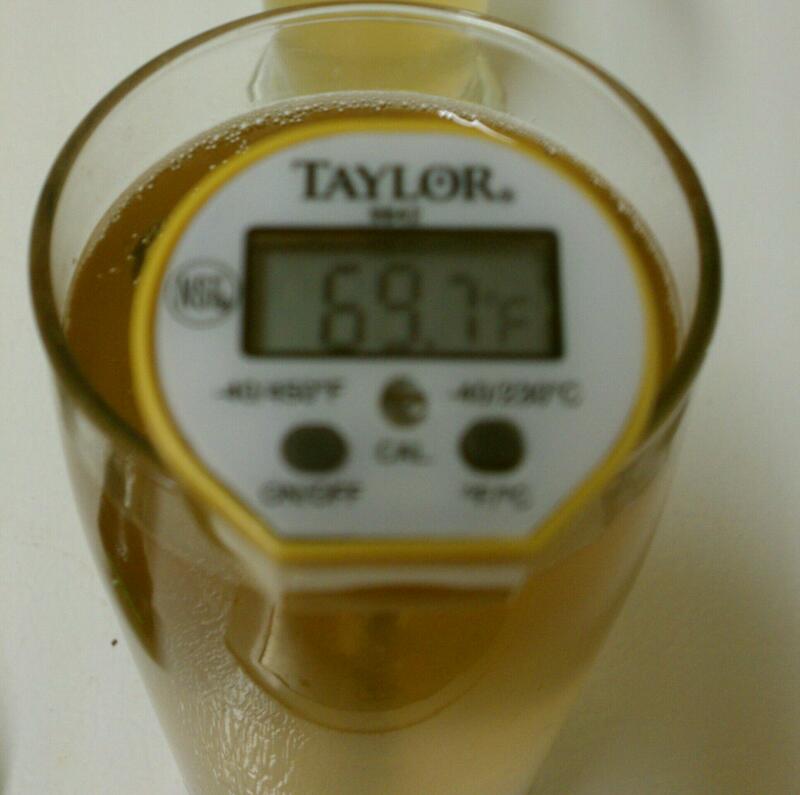 So I feel pretty comfortable with that ph level in my beer. This was a simple experiment that really opened up my eyes to adjusting sour beers after fermentation. I was happy with the original beer, but I’m really please with the adjusted beer. As I said before I don’t think a beer done solely with Lactic Acid would be very good. When I used 6 drops the beer was indeed much more bitter/harsh. Not a beer I would enjoy drinking as it was off flavored and unbalanced. Real live cultures of bacteria/wild yeast and time still remain the way to go for producing world class beer, but I don’t think there is anything wrong with lowering the ph yourself after the fact. What’s a few tenths of a point between friends? I haven’t tested the pH of my latest iteration of Berliner Weisse but I’d wager it has the punch that adding straight lactic acid would deliver but it is by no means harsh or medicinal. I made a 1 liter lacto-only starter and kept it at 100 for 3 days before pitching. It is assertively sour and leaves a lively tingle on your tongue. Instead of the traditional syrups, I add fresh squeezed lemon juice with a little cane sugar to the rim of the glass. It balances out nicely and is quite refreshing. Sour may be the new hoppy! Good luck with your site! Sounds like a yummy Berliner-rita! How long did you let it ferment for? My BW only took two days to reach FG. I pitched half a pack of WB-06 at 68 and it went from 1.030 to 1.008. I’ve also used US-05 and WLP380 and interestingly none of the yeast character or esters associated with wheat yeast seem to come through with this style. Pehaps the sourness masks all of that. I’m going to add citrus zest (orange, grapefruit and lime) in a hop bag to the keg and see how that comes through on my next batch. Berliner Weisse is a blank canvas ready for fermentation experimentation. I made a B.W. a few months ago with a partial sour mash, Euro Ale yeast, then pure Wyeast lacto after fermentation started with the ale yeast. It has a nice pellicle and smells nicely of lacto, but the pH is only 4.1 after all this time. Is there hope that time will lower the pH? Hi Jeffy- My first thoughts are what was the OG and what’s the gravity now? I’ll have to double check, but I think Lacto has an alcohol tolerance of 8 or 9%. How many months has the lacto been in it? Thanks for the reply, Brandon. O.G. On this was 1.041, so I doubt the lactic was overpowered by alcohol. I did not check the gravity when I transferred to the “secondary” but I’m willing to bet that it is (was) pretty low. Perhaps there wasn’t enough residual sugar for the lacto-bacillus to eat? Would this mean that it will not get more sour and/or lower the pH? I neglected to mention that the lacto was pitched about ten weeks ago, at the end of June and has been at temps in the 90’s since then. It was pitched three days after primary fermentation was underway with a good kreusen going at 65F. Three drops in what volume of beer, A shot glass or 5 gal batch? Great point! Info I should have included. I was using an 8 oz glass with about 7.5 oz in it. Pingback: Blinded by Science: The Greatest Impact on Beer Character | F. H. Steinbart Co.